The word “depression” has become a normal part of casual conversation in today’s world. You have probably heard people describe their emotional state as “depressed.” The general conception is that the person is sad, whether or not they are clinically diagnosed with depression is unknown. Yet, however common place it is to describe yourself or others as “depressed”, depression is not a normal part of the aging process and it is crucial to recognize the signs. Depression is a medical illness in which a person has persistent feelings of sadness and lack of interest. Depression goes beyond normal feelings of sadness or grief. Unfortunately, depression often goes undiagnosed and untreated in the senior population. According to the American Geriatric Society, homebound seniors suffer from depression at a higher rate than the general elderly population. 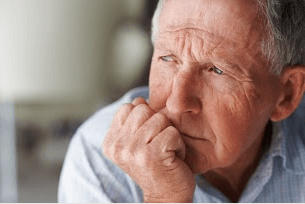 Furthermore, depression is often misdiagnosed as other common senior issues such as Dementia, Alzheimer’s disease, Arthritis, Cancer, Heart disease, Parkinson’s disease, Stroke, or Thyroid disorders. For those who suffer from depression there is treatment and help available. Learn to recognize the signs and seek professional and medical help. Physical conditions and illnesses like stroke, hypertension, atrial fibrillation, diabetes, cancer, dementia, etc. If you or a loved one suffer from depression, there is help. Diagnosing depression can involve a physical, blood tests or body scan. A psychiatric evaluation is often helpful in prescribing the correct medication and in reviewing current medications and their possible side effects. The most effective form of treating depression is through a combination of medication and psychotherapy. Ask your physician can recommend a local therapist. If you think you may suffer from depression, take the necessary steps to seeking help. At Preferred Care at Home we want to be there for you, by your side, every step of the way. Give us a call and learn how we can send compassionate caregivers to your home to provide quality care and companionship.